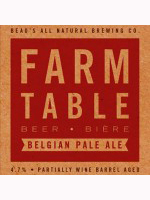 Beau’s All Natural Brewing Company is launching Farm Table Belgian Pale Ale Thursday April 26, on draught only at select locations in Ontario. The new beer is part of the Farm Table line of beers from Beau’s, a series dedicated to exploring traditional styles of beer that serve up big, interesting flavours, but with a sessionable ABV. The Belgian Pale Ale style was first produced in Belgium post WW2 to compete with the growing popularity of the Pilsner style. The farm table BPA has been partially aged in white wine barrels, and features fantastic hop flavour despite its low bitterness. The result is a dry sharp ale, with spicy and fruity notes complemented by a citrusy aroma. Expect mingling notes of mangoes, cloves and peppery character, with hints of oak and tangerines on the finish.